Radius is a great standard. It is powerful enough to accomplish a great deal and simple enough to be easy to handle. Freeradius is an excellent, open source radius server that ships with many Linux variants. It is well documented and well supported. 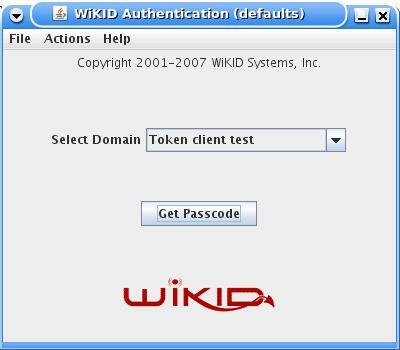 The WiKID Strong Authentication server is a commercial/open source two-factor authentication system that uses public key encryption to transmit PINs and one-time passcodes securely to software tokens running on Blackberries, cell phones, Palms, PocketPCs or, using the J2SE client, Linux, Macs and Windows PCs. You can think of WiKID like certificates, but without the hassles of white lists/black lists and more secure - because the PIN is validated on the server preventing offline brute-force attacks. Companies that need to meet requirements, such as PCI-DSS or HIPAA, may need to secure their networks with two-factor authentication and tightly controlled access. Combining Freeradius and WiKID is a highly cost-effective way to accomplish that. In this example, I am installing Freeradius on Fedora Core 7 and running the 3.0RC2 rpms of WiKID on Centos5 (however, the same instructions will work for the 2.0 version of WiKID.) We'll be testing with SSH, however, the same setup should work for Apache, WebDAV, OpenVPN, and any other application that supports PAM. Configuring Freeradius is fairly straight-forward. There are a lot of options, though. The key is to only change the minimal items that you understand. The default settings work, so make small changes and test them. We will modify three files. The /etc/raddb/clients.conf file tells Freeradius which clients to accept. The proxy.conf file tells Freeradius to send the authentication packets to the WiKID server and the radiusd.conf file configures the main Freeradius server. All you need to change for now is the shared secret as we will login to the Freeradius server via SSH as our test. #  prefix or suffix. User names like "bob" will match this one. Needless to say, change WIKIDSERVER_IP and shared_secret to your WiKID server IP and shared secret. It probably should be different than the shared secret used for the client. 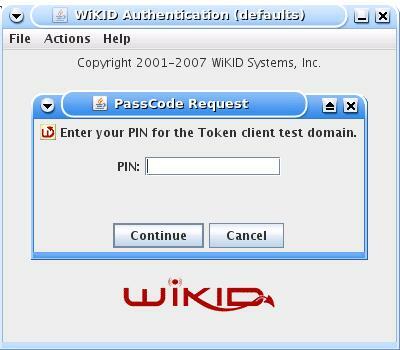 Now, we'll configure the WiKID server to process the one-time passwords from Freeradius. We assume that you also need to set up a new WiKID domain. If you already have one, you may skip this part. Additional WiKID installation documentation is available here. Log into the WiKID server and click on the Domains Tab. Click on Create a New Domain. Enter the information requested. For the IP Address, use the IP address of the Freeradius server. Select Radius and the domain you just created. Click "Add" when you're finished. On the next page, enter the shared secret you entered in the /etc/raddb/proxy.conf file of the Freeradius server. Do not have to enter any information under "Return Attributes". When prompted, enter the WiKID one-time password - it should have automatically been pasted to your clip-board so ctrl-c or shift-ins should work. You should be granted access. If not, there a number of logs to consult. First, check /var/log/secure on your Freeradius server to see why the user was rejected. If you see "All RADIUS servers failed to respond." make sure that radiusd is running on port 1812. Check Freeradius's logs at /var/log/radius/radius.log and the WiKID radius log at /opt/WiKID/log/radius.log on the WiKID server. One of the benefits of using PAM Radius is that servers can be chained in the /etc/raddb/server file. If the top servers fail to respond, the next server will try to authenticate the user. To clarify: if the first server responds with an authentication failure, the user is rejected. Only if the there is no response will the second radius server be checked. This backup capability can be especially handy if your WiKID server is located in a remote datacenter. By configuring PAM to talk directly to WiKID and failing back to Freeradius, you create a fail-over solution in the event of a hardware failure. 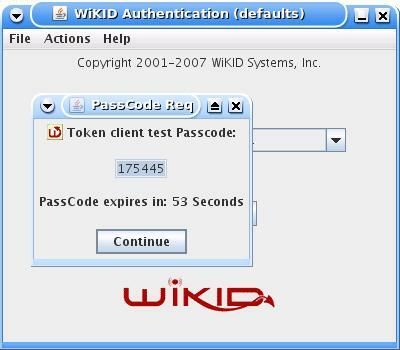 Now, if the WiKID server fails for some reason you have an automatic fall-back to your /etc/passwd file. Radius is an excellent standard for authentication of remote users. Combining Freeradius with WiKID Strong Authentication creates a powerful, flexible and secure solution. Definitely going to be trying my hand at this over the weekend. I gave RSA a grilling over why there isn't enough multi-factor auth single-sign on in use, so it would be hypocritical of me not to be running something like this at home. I would like your help on understanding how exactly or where is FreeRadius a well documented radius server. I have been trying for 6 days now to make freeradius2 work on RHEL/CentOS systems with LDAP and pam_radius for SSH logins and mostly failed - my efforts were mostly try and fail actions as there really is no real documentation on this subject. Can you please let me know where exactly have you managed to find real documentation on free radius?